Lysimachia L., Sp. Pl. 1: 146. 1753. Type species: Lysimachia vulgaris L.
Alsinanthemum Fabr., Enum. 98. 1759. Anagallis L., Sp. Pl. 148. 1753. Type species: Anagallis arvensis L.
Lerouxia Mérat, Nouv. Fl. Env. Paris 77. 1812. Lysimachiopsis A.Heller Minnesota Bot. Stud. 1: 874. 1897. Ephemerum Rchb., Fl. German. Excurs. 409. 1831, nom. illeg. non Hampe (1837), nom. cons., nec Mill. (1754) nom. rej. Type species: Ephemerum nemorum (L.) Rchb. Glaux L. Sp. Pl. 1: 207. 1753. Type species: Glaux maritima L. 1753. Nummularia Hill Brit. Herb. 65. 1756. Not by all authorities - see Tropicos. Numularia S.F.Gray, Nat. Arr. Brit. Pl. 2: 300. 1821. Pelletiera A. St.-Hil. Mem. Mus. Hist. Nat. 9: 365. 1822. Not by all authorities - see Tropicos. Type species: Pelletiera verna St. -Hil. 1822. Steironema Raf. Ann. Gén. Sci. Phys. 7: 193. 1821. Type species: Steironema ciliatum (L.) Baudo 1843. Trientalis L., Sp. Pl. 344. 1753. Not by all authorities - see Tropicos. Type species: Trientalis europaea L.
Linnaeus, C. 1753. Species Plantarum 1: 146. Anderberg, A.A., Manns, U. & Källersjö, M. 2007. Phylogeny and floral evolution of the Lysimachieae (Ericales, Myrsinaceae): Evidence from ndhF sequence data. Willdenowia 37(2): 407–421. doi: 10.3372/wi.37.37202 PDF Reference page. Hassler, M. 2018. Lysimachia. World Plants: Synonymic Checklists of the Vascular Plants of the World (version Mar. 2018). In: Roskov Y., Abucay L., Orrell T., Nicolson D., Bailly N., Kirk P., Bourgoin T., DeWalt R.E., Decock W., De Wever A., Nieukerken E. van, Zarucchi J., Penev L., eds. 2018. Species 2000 & ITIS Catalogue of Life. Published on the internet. Accessed: 2018 July 16.
International Plant Names Index. 2016. Lysimachia. Published online. Accessed June 2 2016. Manns, U. & Anderberg, A.A. 2009. New combinations and names in Lysimachia (Myrsinaceae) for species of Anagallis, Pelletiera and Trientalis. Willdenowia 39(1): 49–54. doi: 10.3372/wi.39.39103 Full text (PDF). Reference page. Tropicos.org 2016. Lysimachia . Missouri Botanical Garden. Published on the internet. Accessed: 2016 June 2. 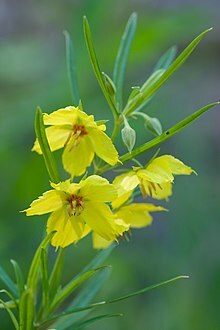 For more multimedia, look at Lysimachia on Wikimedia Commons. This page was last edited on 2 February 2019, at 16:02.